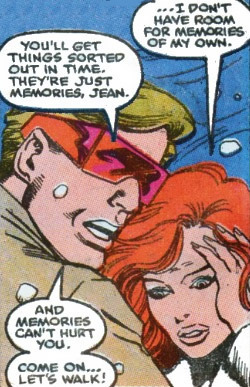 Jean Grey deals with memories she gained from her copies. "I like to remember things my own way." Memory and amnesia in TV, movies, and video games works a bit differently than in Real Life... Why? Because memory often makes for an interesting storyline involving one or more characters, and can be used to make a powerful argument on questions such as identity, destiny, betrayal and love. The usefulness of this trope is tricky, as memory loss isn't as common in Real Life as it is in fiction. Don't worry about it too much, as Tropes Are Tools. Compare Stay Ahead of This Index (as our memories are stored there), Mind Manipulation, Psychology Tropes. Not to be confused with Please Reflect on This Index.